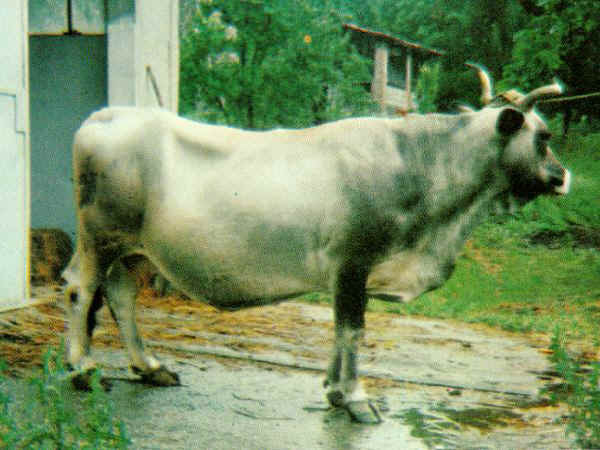 This breed is from Garfagnana (province of Lucca.- Tuscany). It seems it comes from the primitive Podalica. It has undergone a serious decrease after the World War II. It only counts few hundreds heads today. It is a free grazing breed. The coat is frosted grey, shading from light to dark grey. A darker pigmentation around the eyes, on the ridge of the ears, shoulders, knees and thighs, and at the sides of the neck. Black mucosa and wide muzzle with white shade. The tail tuft is black, so are the hoofs and the end of the horns. Both milk and meat but prevailing milk production. Quite good meat production, though.